...seems like that was the motto of the day. My Saturday was spent slobbing around my flat, catching up on Gossip Girl, tidying up and eating carrot cake. For that reason I decided not to waste the contact lenses I wear on a daily basis, but to don the glasses instead. I got these last year. I am one of those awful optical consumers that is never happy with her specs. I take years to find some that don't leave me grimacing in the mirror and then when I do finally hit the jackpot by finding a palatable pair, begrudge their exorbitant cost. Having said that though, I actually love glasses. I love seeing people wear them. I love all the different styles and I love the transformative effect they can have on a face. If they didn't cost so damn much I might have more than one pair. On my face I am wearing my latest love affair...the Bioderma Tinted sunscreen. I changed my tune with this one as I have owned it before and didn't love it at all. It reminded me of Benefit's You Rebel - ie, a colour that didn't quite work and a consistency that never seemed to set. It might be the climate I am in right now, the fact my skin is not that oily these days or just that I applied it with a kabuki and let it set for 5 minutes but I am enjoying it. The coverage hints at the kind that you get from Chantecaille Just Skin and whilst it feels tacky initially it does set. LOL at the kind of flash back that you would get from a 100SPF skin base though. And an even more pointless mention goes out to the La Roche Posay (LRP) Redermic eye cream. b) Their products never let me down. After running out of Avene Ystheal (not one I can pronounce out loud - eeesthe-al?) I thought I would try Redermic and like all creams, I hoped that it would be the one, that it would make a difference. And....well I think it's one of the better eye creams I have ever tried. How's that for a measured statement!? It has almost completely changed the texture under my eyes. It's far smoother and whilst I still have fine lines I think the combination of vitamin C, hyaluronic acid and dimethicone, the latter of which is a known "soft focus" helper, have massively helped. It's the kind of cream that I enjoy using because I genuinely think that when I wake up in the morning, my eye area looks rested and fresh - rather than sunken and dehydrated. ...having said that, if you have any eye cream recommendations for the more active ingredient kind, let me know! LOVIN the glasses & hair! I absolutely love this look on you! I have the same problem with glasses, its an absolute nightmare to find a good pair. Wow your hair looks so beautiful and healhty and those glasses your suit you. LRP is the best, that is all. 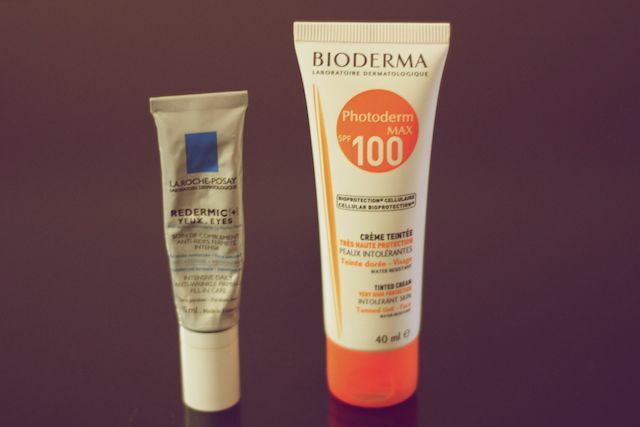 (And Bioderma is a close second, their sun protection is fantastic for people with sun allergy like me). Even with glasses you look lovely. I only wear mine around the house and totally rely on contact lens. I'm looking into a new pair of specs by Ray-Ban that may give me the confidence to wear outside. I cannot wait for your hair post! Very excited...your hairs looks really fabulous. I use LRP products since I was a teenager with acne, and now in my mid 20's i still use this brand and love it. I need to check that Bioderma tinted moisturizer, I am pretty sure since you mentionned it in your blog now we will see a new craze and buzz around that product hehe! I absolutely adore La-Roche Posay!! I use their physiological cleanser and toner daily and even prefer it to the likes of Liz Earle Cleanse & Polish!! The title in itself of this post is fantastic. I rely too much on my contact lenses, too. Only just got into wearing my glasses more regularly after years of having them. Yours look great! I love your glasses story. I'm a "geek" glasses/contact lens wearer and I work for an ophthalmologist and optical store. And trust me, they are right in saying that overwear of contacts are horrid; some of the conditions that I've seen from overuse of contacts are nightmare-inducing. And I can speak from experience, I ended up getting giant papillary conjunctivitis. It's gross, don't google it. Either way, congrats on finally finding a good pair of glasses! It definitely took me like 5 years! I don't believe I've ever seen a product with SPF 100. Yes the flashback would be horrendous!Loving the glasses on you. Nice change. Your hair and glasses combination is absolutely killer, love love love! :) you always look phenomenal, girl! I guess I'm in the minority here... but glasses are one thing I actually do splash out on. I have 3 'high end' pairs and don't regret a single penny spent on them. Any why not - I wear them every day and always feel fab. Origins 'a perfect world for eyes' has been my go-to eye cream as of late. It's got a great texture too - not quite serum, not quite a cream. I love L'Occitane Immortelle eye balm, I feel like I can see a definite change in my under eye area. I've generally really been impressed by L'Occitane lately. Love those glasses! Oh yes, have you tried the Effaclar Duo? Can I ask who cut your hair at JetSet? Looking to make an appointment this month at the JBR location. Thanks! I know its soo hard to find a good pair of glasses! I've had my rayban glasses for about 2 years now and love them but need a new pair... one of the most difficult shopping challenges! Love your glasses though Laura, they look fantastic! Laura I used to follow you on Youtube, being an eyelash slave like yourself. Have you tried any new growth serums? I used Lilash for some time even though it was somewhat irritating-I have been off the serums for awhile-any recommendations? Great geek look! I am a fan of LRP in fact you just reminded me I used to use a redness reduction cream (can't remember the name off the top of my head) but it was brilliant, note to self..must repurchase. Love your hair like this!!! And i am a huge fan of glasses. I wear contacts because I get a headache wearing glasses when out and about.. but every now and then I like to rock the geek! as much as i love looking at pictures on your blog, the main thing i come back for is your superb writing. i love posts like this one, because you seem to have a natural talent in writing...needless to say, you always look amazing, particularly in this picture. It's amazing how much of a difference a good pair of glasses can make! I currently prefer the plain glass, no frame pairs as I look a complete idiot in the "geek glasses" - such a shame as they look so fab! Thank you for your thoughts on the creams, I often eye up La-Roche Posay in Boots but seem to hold off constantly... I may be tempted to invest next time though!! I haven't worn glasses since I was 13. I can't say wearing them with your hair in a ponytail everyday, your tie as high as humanly possible and clunky Clark shoes has the ability to make anyone look cool, a nice little lesson I learned in my first two years at high school. Those glasses look so great on you! I recently tried on several similar-style pairs but they just didn't work on me. Which Mason Pearson do you use? Your hair looks amazing. These glasses really suit you!! I love wearing various stylish glasses also but hate the price! My remedy? I wear my contacts all the time but purchase less expensive glasses at Nordstrom's, Bloomingdale's, or Neiman Marcus. These glasses have simple glass as the lens, but I do not get them finished with prescriptive lenses. I put my contacts on in the morning, choose a pair of frames that fit my personality/outfit for the day, and leave the house being able to see AND feeling smartly accessorized! The glasses look great on you. I wish I could find a pair that suits me. For now, I'll just have to stick to my sunglasses for accessories. i really love your glasses!! Facial surgery is not make full stop on any activities. It just want some time period for perfection and well result of its. Information make that well and attractive. go to gndiscounteyewear.com for a wide range of geek glasses at amazing prices. This is a very informative blog. I would love a little more than my existing expensive pair but cannot justify, life! Love yours, good size/shape/colour. These custom imprinted sunglasses put the finishing touches on any company picnic, add excitement to school events and help to connect every attendee at promo awareness events. How beartiful!I love it!We can also choice mink eyelashes. Natural looking glamorous eyelashes for the most beautiful and natural looking mink eyelashes extention. To express themselves people blow dry their hair, use styling products and even have chemical treatments to get the hairstyles they want.